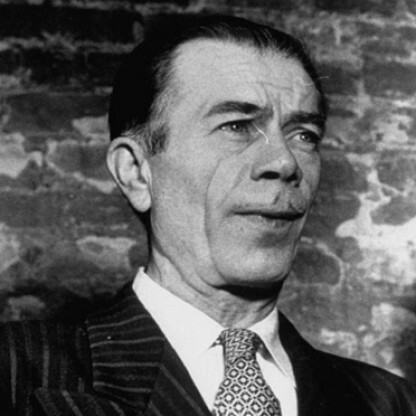 Willie Sutton was bornon June 30, 1901 in Greenpoint, Brooklyn, United States, is Bank Robber. 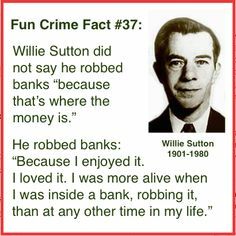 Willie Sutton, born as William Francis Sutton, was an American bank robber notorious for his prolific criminal career which lasted for forty years. He is estimated to have robbed over 100 banks, stealing around $2 million. He was a master of disguise who often impersonated a postal telegraph messenger, police officer or maintenance man. His expertise at carrying out robberies in disguise earned him the nicknames “Slick Willie” and “Willie the Actor.” Besides being an innovative robber, he also had a reputation for cleverly breaking out of prisons, which he did thrice. In spite of being a criminal, Willie was non-violent and polite; he never killed anyone throughout his career as a professional criminal. He always carried a gun on his robberies, but he later admitted that he never carried a loaded gun as he was afraid of injuring anyone. He was often arrested for his crimes and spent half of his adult life in prisons. He was also infamous for not completing a prison term and breaking out. He was first arrested in 1931 and handed a 30-year sentence. But, he escaped the very next year with the help of a smuggled gun and by holding a prison guard as hostage. In 1950, he was listed as the 11th wanted fugitive on FBI Ten Most Wanted Fugitives, eventually being captured in 1952. Sutton also conducted a Broadway jewelry store robbery in broad daylight, impersonating a postal telegraph messenger. Sutton&apos;s other disguises included a police officer, messenger and maintenance man. He usually arrived at banks or stores shortly before they opened for business. Sutton was born into an Irish-American family on June 30, 1901. 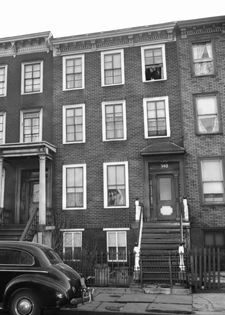 The family lived on the corner of Gold and Nassau Streets in the neighborhood of Irishtown, Brooklyn, now called Vinegar Hill. According to his biography, "Where the Money Was", at the age of three the family relocated to High Street. His father, william Sutton Sr., was a blacksmith. His mother was Mary Ellen Bowles and, according to the biography, born in Ireland; however, according to the 1910 U.S. Census, she was born in Maryland and her parents were born in Ireland. By 1910, she had given birth to five children, of which three were still alive. According to the 1910 Census, his maternal grandfather, James Bowles, and his two maternal uncles were also living with the family. 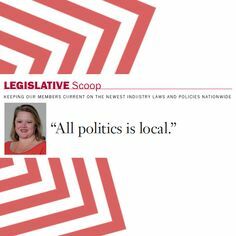 Sutton was the fourth of five children, and did not attend school after the 8th grade. He became a Criminal at an early age, though throughout his professional Criminal career, he did not kill anyone. Described by Mafioso Donald Frankos as "a little bright-eyed guy, just 5&apos;7" and always talking, chain-smoking ... cigarettes with Bull Durham tobacco." 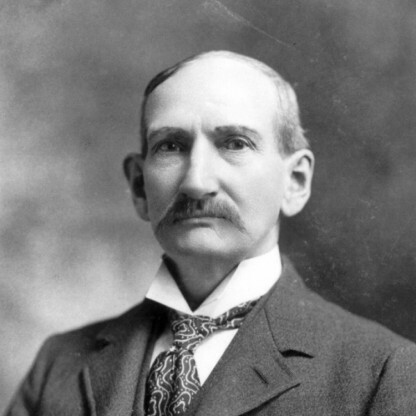 Frankos stated also that Sutton "dispensed mounds of legal advice" to any convict willing to Listen. Inmates considered Sutton a "wise old head" in the prison population. When incarcerated at "The Tombs" (Manhattan House of Detention) he did not have to worry about assault because Mafia friends protected him. 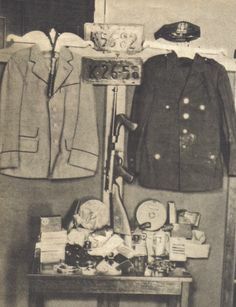 In conversation with Donald Frankos he would sadly Reminisce about the 1920s and 1930s when he was most active in robbing banks and would always tell fellow convicts that in his opinion, during the days of Al Capone and Charles Luciano, better known as Lucky Luciano, the Criminals were the bloodiest. 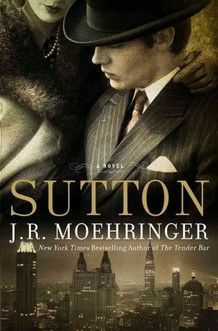 Gangsters from the time period, and many incarcerated organized crime inmates, enjoyed having Sutton for companionship. He was witty and non-violent. 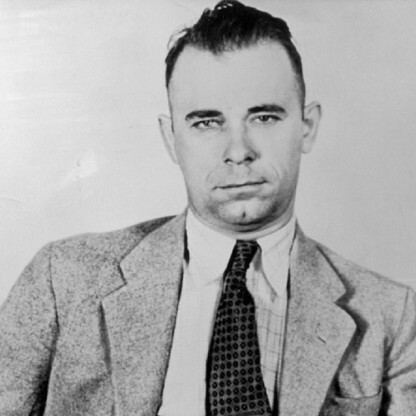 Frankos declared that Sutton made legendary bank thieves Jesse James and John Dillinger seem like amateurs. Sutton married Louise Leudemann during 1929. She divorced him while he was in jail. Their daughter Jeanie was born the next year. His second wife was Olga Kowalska, whom he married during 1933. His longest period of (legal) employment lasted for 18 months. Sutton was captured and recommitted in June of 1931, charged with assault and robbery. He failed to complete his 30-year sentence however, escaping on December 11, 1932, using a smuggled gun and holding a prison guard hostage. With the guard as leverage, Sutton acquired a 45-ft (13.5 meter) ladder to scale the 30-ft (9 meter) wall of the prison grounds. On February 15, 1933, Sutton attempted to rob the Corn Exchange Bank and Trust Company in Philadelphia, Pennsylvania. He came in disguised as a postman, but an alert passerby foiled the crime. Sutton escaped. On January 15, 1934, he and two companions broke into the same bank through a skylight. 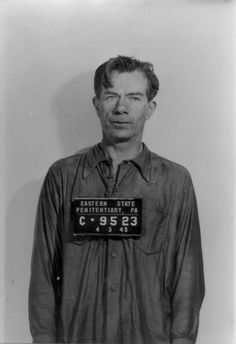 Sutton was apprehended on February 5, 1934, and was sentenced to serve 25 to 50 years in the Eastern State Penitentiary in Philadelphia, Pennsylvania, for the machine gun robbery of the Corn Exchange Bank. On April 3, 1945, Sutton was one of 12 convicts who escaped the institution through a tunnel. Sutton was recaptured the same day by Philadelphia police officer Mark Kehoe. 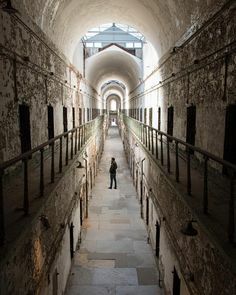 Sentenced to life imprisonment as a fourth time offender, Sutton was transferred to the Philadelphia County Prison, Holmesburg section of Philadelphia, Pennsylvania. On February 10, 1947, Sutton and other prisoners dressed as prison guards carried two ladders across the prison yard to the wall after dark. When the prison&apos;s searchlights hit him, Sutton yelled, "It&apos;s all right!" No one stopped him. On March 20, 1950, Sutton was the eleventh listed of the FBI&apos;s FBI Ten Most Wanted Fugitives, created only a week earlier, on March 14. The Redlands Daily Facts published the earliest documented Example of Sutton&apos;s law on March 15, 1952 in Redlands, California. A series of decisions by the United States Supreme Court during the 1960s resulted in his release on Christmas Eve, 1969, from Attica State Prison. He was in ill health at the time, suffering from emphysema and in need of an operation on the arteries of his legs. 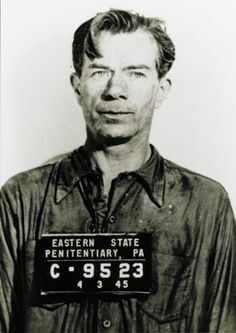 During December 1969, in response to a motion by Sutton&apos;s attorneys, Farrell ruled that Sutton&apos;s good behavior in prison and his deteriorating health due to emphysema justified commutation of his sentence to time served. At the hearing Sutton responded, "Thank you, your Honor. God bless you," and wept as he was led out of the court building. During 1970, a separate 30-years-to-life sentence given in Brooklyn during 1952 was also commuted on similar grounds, and he was released to parole. Sutton died in 1980 at the age of 79; before this, he had spent his last years with his sister in Spring Hill, Florida. He frequented the Spring Hill Restaurant where he kept to himself. After Sutton&apos;s death, his family arranged a quiet burial in Brooklyn in the family plot.